One of the most common problems with decks in Minnesota is frost heave. Today I’ll explain how this works, why it matters, and what steps can be taken to help prevent damage from frost heave when building a deck. 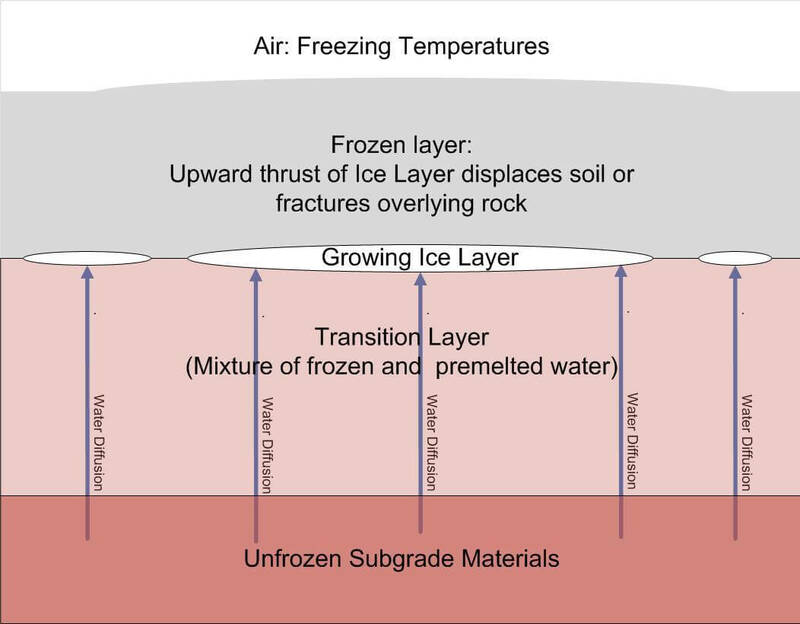 When expansive soils freeze and expand, the earth rises. Wikipedia has a nice illustration of how this works, shown below. How much can soils heave? It depends. 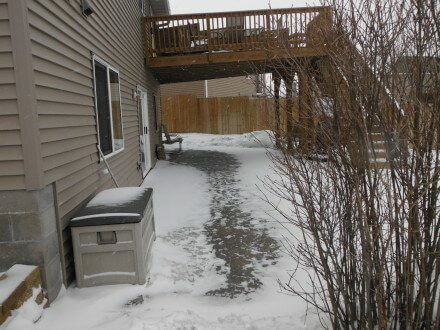 I once lived in a townhouse in Saint Louis Park with a patio that would heave about 4” during the winter; it got so bad that I could barely open my storm door during the winter. Without a doubt, some of the worst frost heave I’ve come across has been here in Maple Grove. 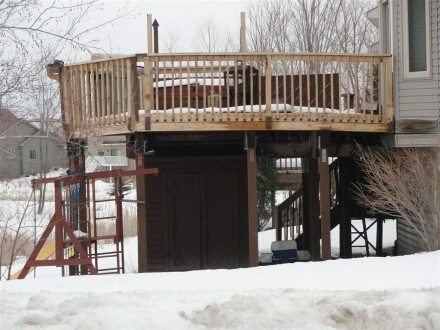 The photo below shows a Maple Grove deck that we recently inspected in the middle of an April snow storm. The right side had obviously heaved several inches. Click on the photo for a larger view. The deck shown below had severe frost heave in the middle and against the house, and had to be completely torn down and rebuilt because the deck was so severely heaved in the middle. Here’s one more photo showing major frost heave at a deck. 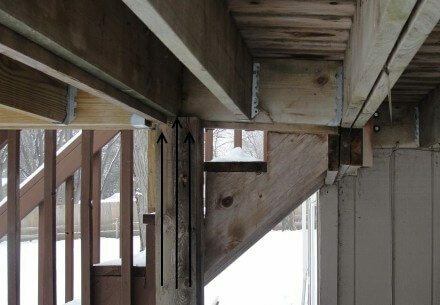 When a deck is attached to a building, the part of the deck that gets supported by the earth needs to have proper frost footings. The most common deck footing is basically a big chunk of concrete poured in to a hole in the earth. The goal is to have this chunk of concrete go deep enough in to the ground so that the bottom rests on soils that never freeze, which should prevent the soils from pushing the footing up. When deck footings aren’t poured deep enough, decks can heave. Sandy, well drained soils aren’t particular susceptible to frost heave, while soils with higher clay content are prone to frost heave. This is why it’s so important for deck footings to extend down below the frost line. How deep do footings need to be to prevent frost heave? There’s no magic number. When there is a lot of snow on the ground, the snow acts like a layer of insulation and reduces the frost depth. 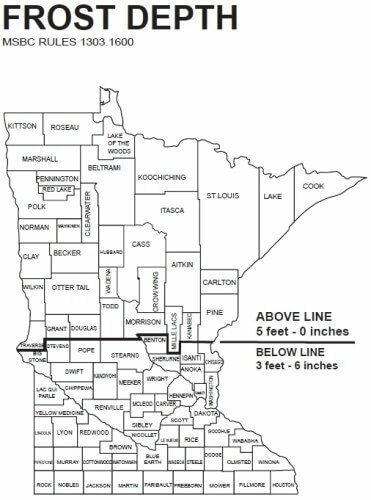 When it’s a winter with very little snow, like the type Minnesota experienced in 2011-2012, the frost depth will be much deeper than usual. Outdoor temperatures obviously make a difference, and so does proximity to water. Decks constructed near wetlands will have an increased potential for frost heave. 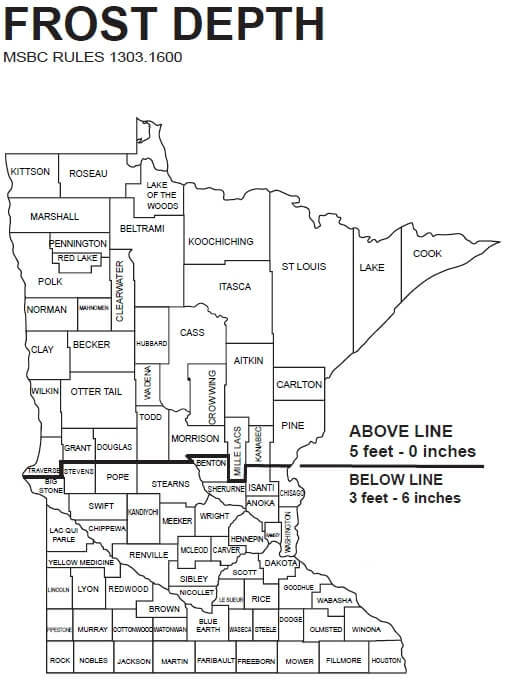 The Minnesota State Building Code requires footings to be a minimum of 42” deep in the southern part of the state, and a minimum of 60” deep in the northern part of the state. The diagram below shows the dividing line. While footings need to be deep enough in the soil to prevent frost heave, the depth of the footing is only one part of the equation. No matter how deep the footing is, if the surrounding soils expand enough to ‘grab on’ to the concrete footing, the surrounding soils can pull footings up out of the ground. 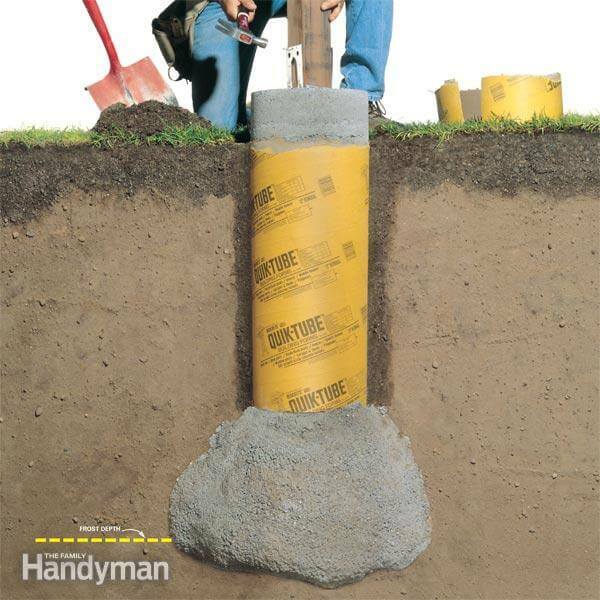 One step that can be taken to help prevent soils from grabbing on to the footing is to use waxed cardboard tubes for the footings, often referred to as sonotubes. The Family Handyman web site has a great cutaway photo of a footing with one of these tubes, used with permission below. Another step to prevent heaved footings is to ‘bell’ out the bottom of the footing, as shown in the photo above. The ‘bell’ shape at the bottom prevents soils from pushing the footing up and out, but it can also lead to a fractured footing. When expansive soils grab on to the walls of a footing and pull it up, the bell at the bottom will hold the footing in place until the pressure exerted by the frost exceeds the tensile strength of the concrete. Once that happens, the footing will simply break in half. When you consider the relatively low tensile strength of concrete and the tremendous amount of force exerted by frost, it’s easy to understand how pier footings can break. One step that can be taken to help prevent this is to use rebar inside the footings. 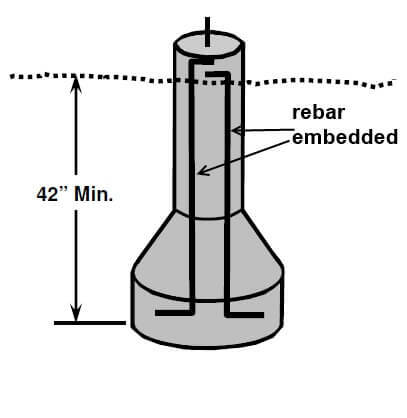 The diagram below, courtesy of the City of Maple Grove, shows a deck footing with rebar embedded to help prevent the footing from breaking. Next week I’ll have a follow-up post on a newer style of footing for decks that might just be the next big thing.